The video game industry is a potential data gold mine for email marketers, and today Sending.io, an email tech company, launched out of beta to take advantage of the opportunity. Sending.io leverages email marketing’s ROI through email-based loyalty rewards programs for mobile gamers. The Palo Alto-based startup's focus is to utilize email marketing to help app companies monetize users outside of a mobile app, generating more revenue by moving beyond in-app purchases. Gamers register their emails in-app to receive daily rewards such as virtual currency, for participating in the program. While consumers benefit from rewards, marketers benefit from the email data. Amy Monier, vice president of business development and cofounder of Sending.io, called email "a valuable piece of personal data." Sending.io can access that email data to create customer profiles and email user databases for better behavior-based ad targeting. Monier says developers and marketers have not taken full advantage of email’s high ROI in the ever-growing mobile gaming space. She says the most common form of email use in mobile apps is a traditional newsletter. Incorporating a performance and incentive-based loyalty rewards program, however, can boost engagement rates significantly by benefiting the consumer more. It also offers a more personalized connection. “People want this email. They’re looking for it every day,” she says. Sending.io reports strong ROI metrics for their new email rewards program, and claims that email clicks are on average 50% and that fewer than 1% of users have chosen to opt-out. Sending.io says it has also seen increases in user retention rates by 15% and increases in advertising revenue by over 300%. The majority of Americans now play mobile games at least once a month, according to eMarketer. Americans also spend more time playing mobile games, surpassing PC games by nearly 10 to 1. This number will only grow as mobile devices become more common and mobile games become more popular. Mobile gaming is expected to grow at twice the rate of the global video game market, according to market research firm Newzoo. Mobile games accounted for 29% of the $83.6 billion global game market in 2014, but Newzoo predicts mobile will account for 39% of the predicted $113.3 billion global games market in 2018. 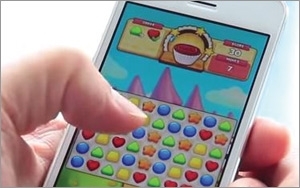 Dominant gaming companies are noticing the opportunities of mobile gaming, too. Nintendo, a traditionally console-based video gaming company, announced plans to enter the mobile and tablet games industry earlier this year.